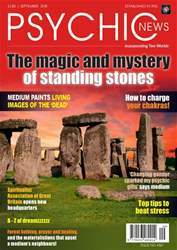 In the September issue we take an in-depth look at the magic and mystery of standing stones, dreams, tips to beat stress, the new headquarters of the Spiritualist Association of Great Britain, the divinity within all, how to charge your chakras, and Sandy Ingham – the medium who paints living images of the ‘dead’. 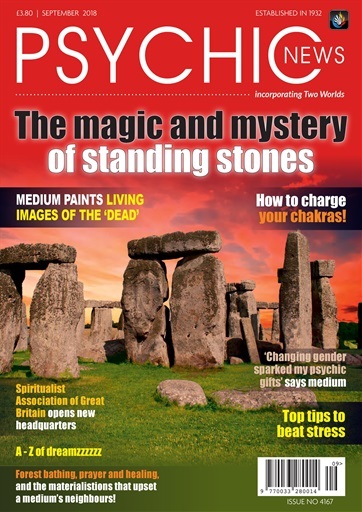 As well as news and views from the editor’s desk, featuring Victoria Beckham’s fascination with crystals, how prisoners can be helped with colour and horse therapy, mindfulness in the Girl Guide movement, organ transplants and pollution, we report on the World Congress of Spiritualists and how changing gender sparked a medium’s psychic gifts. We take a look at Abigail Latham’s spiritual art, land sculptures and mandala colouring book. Graham Jennings answers your questions on forest therapy and spiritual healing , and recounts how a pioneering medium’s materialisations walked around his garden which caused neighbours to threaten to call the police!